The Economist (01/17/13) – Interesting to note the diverse type of projects, industries and products that are all now successfully using Kickstarter rewards and donation crowdfunding campaigns to raise money from the Crowd. 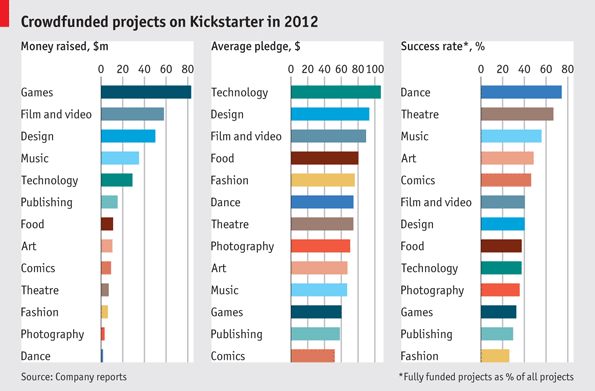 Games raised the most crowdfunding money overall. Technology took the lead in the most money donated per transaction. And the performing arts took the #1 spot in the overall success rate. VC funding was down 15 percent in 2012, while crowdfunding grew 91 percent, as a new infographic from Startups.co shows. And while venture capitalists focused on biotech, software, and industrial energy, angel investors focused on Internet startups, healthcare, and mobile. Which makes a lot of sense, given the massive disparity in investment size required for those sets of industries. The cause of the shift in funding? VCs invested less due to unfavorable IPOs such as Groupon in late 2011, and Facebook mid-2012, as well as concerns about additional taxation on capital gains due to fiscal cliff fears and the presidential election. On the other hand, crowdfunding grew, according to Startups.co, on the strength of the JOBS Act passage in April — and simply due to the fact that Kickstarter and Indiegogo campaigns like Ouya’s have raised millions of dollars, demonstrating that crowdfunding is a viable way to launch a product or start a business.